American Standard has upped the design ante with DXV, the first commercially-available residential faucets created by additive manufacturing, aka 3D printing. 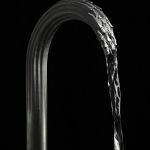 Using a process called selective laser sintering, these are the first ready-for-market working residential faucets to be printed in metal. 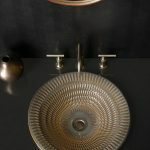 Part of the Kohler Artist Editions and made using small batch production techniques, the new Derring Collection uses a glaze with textural carvings that create complex colour transitions, capturing and playing off of the lighting and movement in the room. 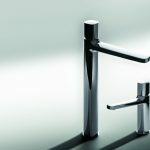 The new Hansgrohe ShowerSelect trims for iBox combine geometric design and push-button control into one sleek package. 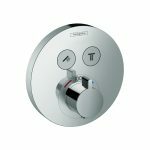 Like everything in the 21st century, the shower experience can change with the touch of a button, switching functions on and off and transforming spray modes. 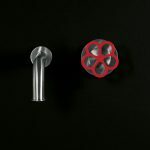 Pipe is an accessories series spin-off of the Marcel Wanders-designed red taps for Boffi, but are now multipurpose hooks intended for hand towels or bathrobes. Fisher Island, a private island off the coast of Miami Beach known for its lush, serene ambiance is the inspiration behind Boffi’s newest bathtub designed by Piero Lissoni and CRS Boffi, and which debuted at Milan Design Week. 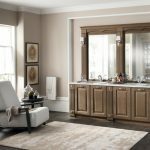 The new W2 line by Montreal-based Wetstyle targets small bathroom spaces and includes three freestanding soaking tubs and a new all-wood furniture collection with a slim profile integrated washbasin. 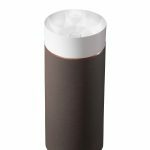 To help improve the occupant experience even into washrooms, SCA has released the new Tork Image Design line of towels, bath tissues and soap dispensers (shown), made of brushed stainless steel exteriors featuring anti-fingerprint protection. 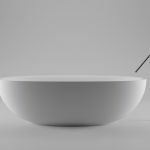 Villeroy & Boch’s new freestanding Octagon washbasin, designed by Kai Steffan, made its North American debut during November’s BDNY fair in New York. 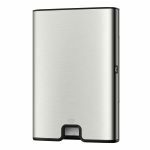 Made using TitanCeram, a proprietary blend of clay, quartz, feldspar and titanium oxide, allows for extremely thin walls and clearly defined edges. 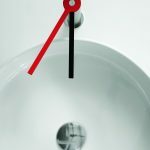 The Time bathroom faucet by Aquabrass cleverly evokes a clock dial, as the thin lever blends both shapes of the faucet. With a rotative upward movement, 4 o’clock will release a sheet of cold water, 8 o’clock for hot water, and 6 o’clock will shut off the aerated flow.